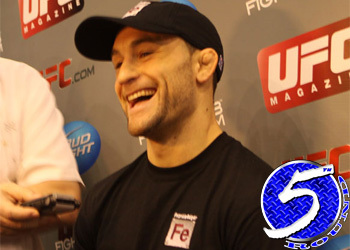 Although UFC president Dana White praised lightweight champ Frankie Edgar (Pictured) for his pound-for-pound prowess during the post-fight press conference, MMA’s ultimate shot caller also suggested it would be best for Edgar if he dropped 10 pounds and moved to the featherweight division. While his Rocky Balboa-esque heart allowed him to post back-to-back beatings on BJ Penn, who most considered as the best 155-pounder on the planet prior to facing Edgar, then survive two vicious 1stRound onslaughts by a significantly-larger Gray Maynard, White clarified after the presser wrapped that he’s merely looking to extend Edgar’s career. “All these other guys that he fights are so much bigger than him,” White said after Edgar scored his second title defense. “I think that fighting out of your weight class isn’t healthy. I don’t think it’s healthy long-term. Middleweight champ Anderson Silva was allowed to hop to the light heavyweight division on a couple of occasions without having to relinquish his crown, but White professed that if Edgar opted to swim in Jose Aldo’s pond he would have to abandon his lightweight belt. Although it might be an ideal scenario for White, he won’t look to force the issue. “Honestly, I’d like to see him move to 145 and fight Aldo,” White flatly stated. “I’m not going to make him do it. Edgar owns an impressive 14-1-1 professional record. The 29-year-old avenged the only blemish on his resume with his TKO win over Maynard on Saturday night.